All the currently open Finder windows are displayed in the "Window" menu of the Finder. There are three possible indicators at the left of the name of the window: nothing, a checkmark or a diamond. When there is nothing at the left of the name (like next to "Scratch Disk" in the screenshot), it means the window is opened but not currently active. With a checkmark (like next to "Macintosh HD" in the screenshot), it means it is the currently active window. A diamond at the left of the name (like "LaCie" in the screenshot) means the window is minimized. "Play Soft Sounds" in Perian! There is a great feature in Perian and it is "Play Soft Sounds:". 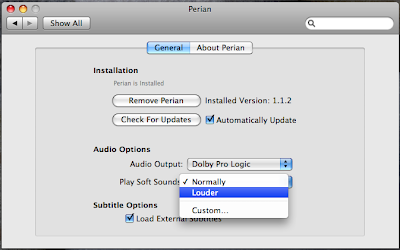 The options are "Normally", "Louder" or "Custom...". It is actually Dynamic Range Compression. When it is enabled, loud sounds are played softer and soft sounds are played louder. The advantage is that you don't have to keep adjusting the volume throughout the movie. It is possible to insert a Custom Footnote in Pages. It is actually hidden under the "Footnote" feature. You just have to hold down "Option" and in the "Insert" menu, "Footnote" will change to "Custom Footnote". CrossOver Mac free today only! There are only a few hours left to get CrossOver for Mac free. It usually retails for $39.95. 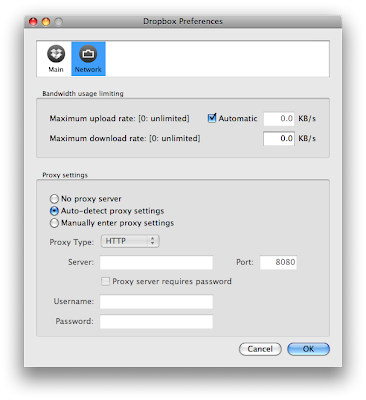 It lets you run some Windows applications on OS X without the need of running Windows in virtualization. Link: http://lameduck.codeweavers.com/free/ PROMOTION IS OVER. Windowed processes in Activity Monitor! When you are looking for a process in the Activity Monitor and it is a currently running application, you'll have to go through many OS X processes. In the "Show" dropdown menu, you just have to switch "All Processes" to "Windowed Processes" and only the process of the running applications will be displayed. It is much easier to go through the list and find the one you are looking for. 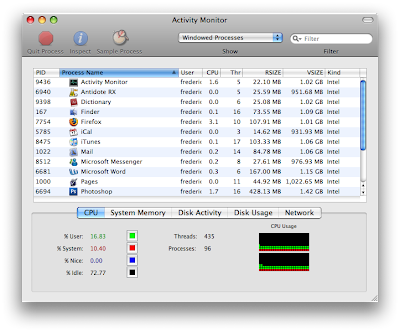 Activity Monitor is an application in the Utility folder. In the iStat menu preferences, under "Date & Time" and "Format", there is an "Edit" button. This lets you entirely customize how the menubar icon looks. I actually got rid of the date icon, because I also use MenuCalendarClock and I totally replaced the OS clock with iStatMenu. You can remove the OS clock by either holding down "Command" and dragging it out of the menu bar or by unchecking "Show date and time in menu bar" in the Date & Time preferences, in the "Clock" tab. You can get iStatMenu here from MacUpdate. "Secure Empty Trash" is a great feature for confidential data, but if you erased a file and forgot to do it, it is still possible to truly erase it. 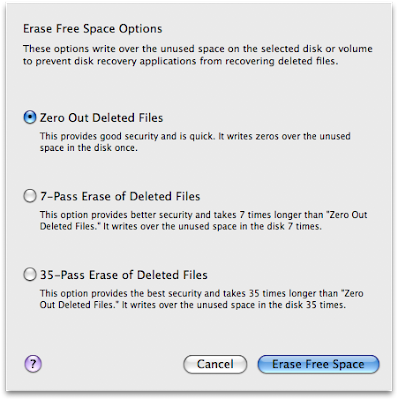 In "Disk Utility", under "Erase", there is a feature called "Erase Free Space...". It will actually overwrite all the free space on your hard drive. You can choose "Zero Out", "7-Pass" or "35-Pass". Zero Out is usually fine, but if you want to make the data even harder to recover, 7-Pass is also a good option. 35-Pass takes just way too much time! My desktop always ends up with hundreds of icons, to the point where I run out of desktop space (on a 23" ACD). I had already switched to smaller 32x32 icons, but I have now found a solution that takes even less space. I switched the Label position to "Right" instead of "Bottom". It really makes a huge difference and even more text is displayed. You can change the Label position in the "View Options" (Command - J). It is called "Minefield" once you install it, but it is actually the latest experimental build of Firefox with the multi-touch gestures. You can learn more about this version of Firefox and download it here. Healing brush or spot healing brush in Photoshop! The spot healing brush is usually perfect and it is really the fastest way of quickly fixing imperfections in photos, but if what you are trying to fix is too close to an edge, it won't work really well. The healing brush can work better in this case, because it works by sampling another part of the image instead of using what is around the spot you are trying to fix. To create the sample for the healing brush, just hold down "Option". 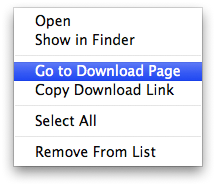 If you want to go back to the page where a file was downloaded in Firefox, you just have to right-click on the download in the Firefox download window and choose "Go to Download Page". The page where you downloaded the file will load in a new window or a new tab! 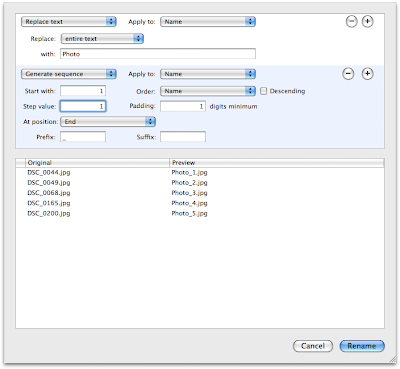 There are many ways to select multiple files in either list, coverflow or column mode. The one I always use is I select the first file, I hold down "Shift" and I click on the last file. It selects all the files in between. There is another way to do this however. You just have to click on the first file at the right of the name, not on the name of the file, and scroll down to select all the files. It won't move the file like it would usually do because you didn't click on the name of the file. I didn't liked the way it worked when I accidently discovered it, but I finally think it is a feature, not a bug! Moving a window without bringing it to the forefront! I actually saw this tip on Tekzilla, but it is so cool that I had to post about it. What it lets you do is move windows that are not the currently active windows without bringing them to the forefront. It is hard to explain, but you'll get a good idea once you try it. You just have to hold down "Command" and click on a window that is not currently active to move it. It doesn't work with all windows, but it usually works well. Thanks for the tip Tekzilla. There is a feature called "Sound Check" in iTunes and what it does is it adjusts the volume of playlists so that you don't have to change the volume all the time. iTunes actually analyzes the volume of all songs to make the adjustments. 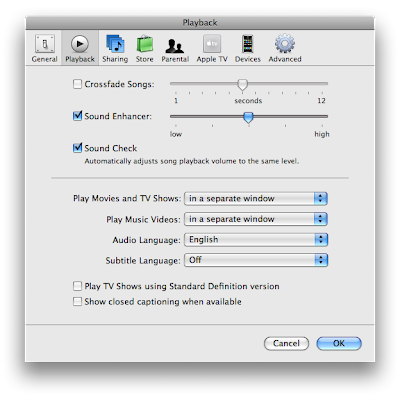 You can enable the feature in iTunes' preferences, under Playback. 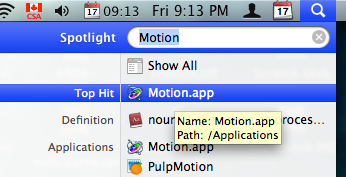 You can quickly display the path of a file in Spotlight by just moving the cursor on top of the Spotlight result and waiting a few seconds. A small box of text will appear with the Name and the Path. iPhoto to Photoshop, Pixelmator or any editing app! 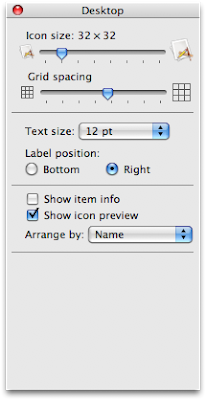 A great tip submitted by Dominic P. Tremblay: iPhoto to Photoshop, Pixelmator or any editing app! What is great on a Mac is how you can just drag a file to an app on the Dock. You can do the same thing with photos in iPhoto and just drag the photo on top of an editing application. What is even better is that once you are done editing the photo, you can just save the file and when you go back to iPhoto, the modifications will appear. You have to be careful with that though, because it is destructive editing and once it is saved, you can't go back. Thanks for the tip Dominic! QuickCal is a new widget to add events to iCal from the dashboard. It is also possible to add to-dos. It is not obvious how to use the widget at first, but as soon as you start typing in the box, it suddenly makes sense. You are also sure that it is doing what you want, because it displays what it is going to do just under the text box as you are typing. You can download the widget here from MacUpdate. The shortcut we all use for Quick Look is Space Bar, but it has another shortcut that I didn't even know about. It is "Command - Y". The shortcut can be useful if you want to go directly to full-screen Quick Look. You just have to add "Option" so that it is "Option - Command - Y" and that new shortcut will go directly to full screen. 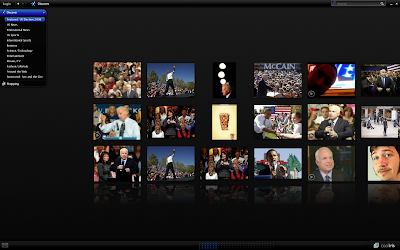 If you select multiple photos, it will also launch a slideshow. In the Edit mode of iPhoto, there are easy effects that you can apply really quickly. What is really great is that these effects are stackable even if they are not applied yet. To access these effects, you just have to click on "Effects" in the bottom toolbar. 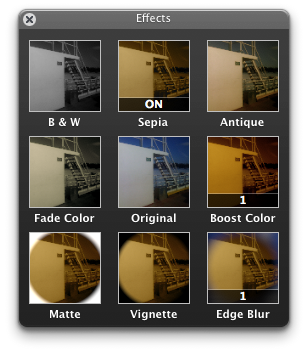 Some effects are not just "ON" or "OFF", but are customizable as 1, 2, 3 and more. You just have to use the arrows to remove or adjust the customizable effects. Watch TV on your Mac! A few years ago, I really thought Elgato products were the solution, but IPTV has really improved since. Joost was never really quite there because it is not live. A new app was released recently. It is Livestation. There are a few channels included with the app that nearly always work and the quality is great. For a better selection, you can search through user streams. The quality of user streams is not as good and they sometimes stop working, but it is one of the only options if you want North American channels. You can download Livestation here from MacUpdate. A feature that I just discovered recently in ForkLift is "Batch Rename". There are a few freewares that can do the same thing, but ForkLift really does it well. Batch renaming wasn't as necessary when I started storing music and photos in apps like iTunes and iPhotos. 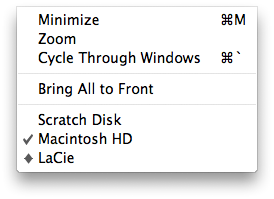 When many photo, music or video files are stored in the Finder however, batch renaming is very useful. A freeware that can do this is "Name Mangler" (link to MacUpdate here). 1. 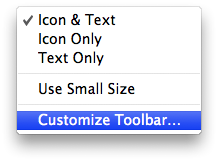 Right-click on the toolbar and choose "Customize Toolbar...". 2. Add "Batch Rename" to the toolbar. 3. Choose multiple files that you want to rename. 4. Click on Batch Rename. CoolIris was released to replace PicLens and there are some great new features. You can now launch it on any website even if the website is not compatible. The photos and videos from the website won't be displayed of course, but a new "Discover" menu now lets you browse through photos from the Web. You can also search Flickr, YouTube, Google Images and many other websites directly from CoolIris. You can get CoolIris by updating PicLens through Firefox plugin updates or downloading the install here from MacUpdate. Sharing Apple Loops between accounts on a Mac! When you install additional Apple loops on your Mac, they are only available to the account that you used to install them. If you installed the loops on an admin account, you can make the loops available to all accounts. You can change the setting in GarageBand preferences, under "Loops". 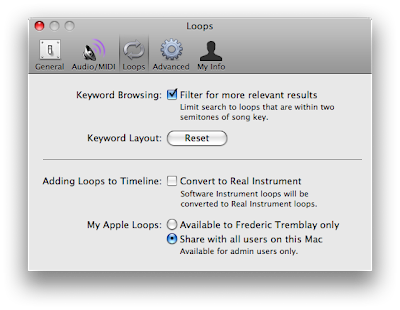 It is "My Apple Loops:" that you can change to "Share with all users on this Mac". Clear the search history in Firefox or Safari! In Safari, simply clicking on the magnifying glass in the search bar will let you "Clear Recent Searches". The magnifying glass in Firefox's search bar doesn't work that way however. Clicking on the Google icon will only display a list of websites where you can search. Recent searches will be displayed automatically when you type. 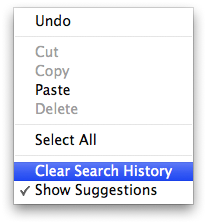 To clear the search history, you just have to right-click on the search bar and choose "Clear Search History". Leave Growl notifications on screen! 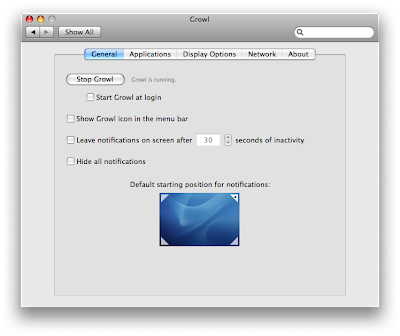 Growl notifications are great and are so well implemented in many applications. There is an option in Growl preferences so that it leaves the notifications on screen when the computer is inactive for more than 30 seconds (you can change the length of time). It works well when you are away from your computer. You'll be able to read everything that happened on your Mac when you come back. The option is in System Preferences, under Growl (if you don't have Growl installed, you can check the previous tip or search Growl on MacUpdate or VersionTracker). There really is no difference between MP4 and M4V, but M4V files automatically load in iTunes. Handbrake lets you create either an M4V or an MP4. If you get an MP4 file however, you can easily change it into an M4V to make it iTunes-friendly. There is no conversion necessary because it is already using the right codecs. You just have to change the extension. 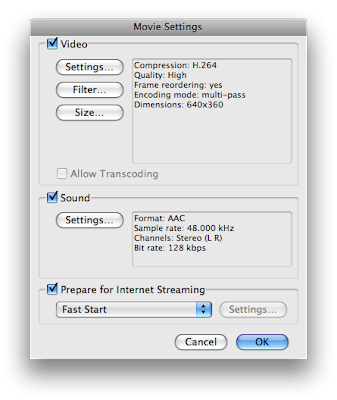 Double-clicking on an M4V will load iTunes, but it is still possible to open it in QuickTime. Different avatars for each account in Adium! Adium lets you connect to many instant messaging accounts, but there is also a way to set different avatars for each account. You can change it in Adium Preferences, under Account. From there, you just have to select the account and click "Edit". The avatar is in the "Personal" tab. To set it only for that account, change it to "Use this icon" instead of "Use global icon". You can then change the avatar specifically for that account. Genius is a great new feature of iTunes 8, but the playlists created are not always perfect. Unfortunately, Apple didn't include a feature so that you can tell Genius what songs are not a good match to the playlist. One thing that you can do to improve what Genius does is to rate songs. Of course, it won't improve songs that don't match with a specific playlist, but it will choose more songs that you like. By default, songs are not rated in iTunes and it didn't use to matter much, but it matters a lot more with Genius. You can just add your rating in the "Rating" column in iTunes. You can also rate the songs on the iPhone/iPod Touch when you are not in Coverflow mode, by double-tapping on the album art. A list of songs in the same album will be displayed. You can add your rating at the top of the list. You can also set the rating on the other iPods (I tried on a 1st gen Classic) by clicking twice on the center button and adding the stars with the scroll-wheel. The way Firefox handles mailto! The buffer size in iTunes! Quit the Finder (not force quit)!